Recently, the street dance documentarians ventured deep into the NYC underground (literally) to document the Flexing prowess of the Brooklyn-based NextLevel Squad. Flexing (also called Bonebreaking) is a relatively new and potently individualistic fusion dance form that evolved in NYC out of Jamaican bruk-up, and incorporates popping, gliding, contortion, as well as various moves gleaned from martial arts, jazz dance, ballet, gymnastics, and whatever else looks damn good. There are many, many things to love about this video… not least of which is watching a burgeoning subculture breathe new life (so to speak) into ye olde gas-mask chic! 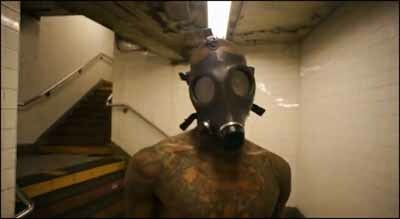 The gas masks and the griminess of the subway just make that film. Beautiful moves, excellent location, really enjoyed the music too. I found myself glancing at the commuters a couple times trying to decipher a response. The boxers sticking out was sort of distracting, but I guess they have to be comfortable to do their stuff. And it is great stuff. Thanks! But I will never understand why young people need to show off their underwear.